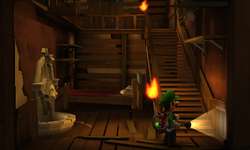 The Toolshed Stairs is a room inside of the Haunted Towers in Luigi's Mansion: Dark Moon. The Toolshed Stairs can be accessed by taking the secret passage behind the fountain inside of the Tool Shed. The Toolshed Stairs is a four-floor room that has no notable features. The stairs that go between the second and third floor are destroyed, meaning Luigi has to find an alternate way. The door on first floor of the Toolshed Stairs takes Luigi back to the Tool Shed. The door on the left on the second floor takes him to the Botany Lab and the door on the third floor takes him to the Seedling Laboratory. The door to the north on the second floor is actually a Trapdoor. The door on the fourth floor takes him to the Conservatory. The third and fourth floors are also covered with various foliage. In B-2: The Pinwheel Gate, Luigi needs to go to the Toolshed Stairs to get into the Botany Lab. There are only several steps present and a Greenie needs to be fought on the second floor. On the first floor, there is a stack of bills and a few coins. On the third floor, Luigi can shake a vase to cause a gold bat to appear. In B-3: Graveyard Shift, all the steps on the first floor of the Toolshed Stairs are intact. During B-5: Doggone Key, Luigi needs to chase the Polterpup to the Toolshed Stairs. When Luigi reaches the stairs, he is ambushed by a Creeper on the first floor. There is also a bed on the first floor, but it cannot be inspected. On the third floor, kicking the vase causes a gold bat to appear and inspecting the drawer causes a Gold Greenie to appear. In B-5: Doggone Key, instead of capturing the Creeper as the Polterpup waits on the second floor, if the player pulls the Creeper to the bed, then walks past him as the Polterpup jumps to the third floor, the room will bright up even if the Creeper is still there. This page was last edited on November 10, 2017, at 08:16.